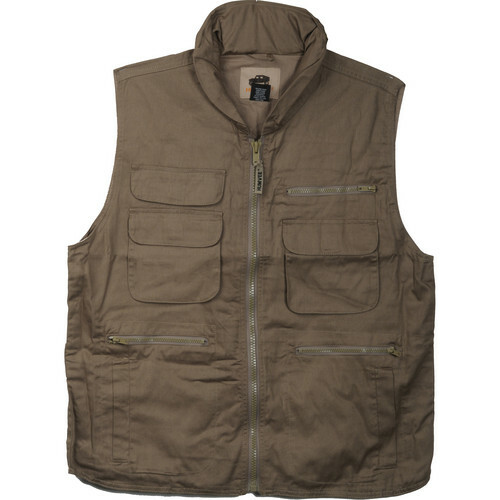 Size 1/2 Chest = 26"
Box Dimensions (LxWxH) 25.0 x 15.0 x 0.7"
Ranger Vest - X-Large (Khaki) is rated 4.4 out of 5 by 24. Rated 5 out of 5 by Captain Mango from Great vest, great price, free shipping! I wear Ranger Vest nearly every day & have so for years. I like them better than standard photographers vest because of the stand up collar & hood. I've worn RV in the bitter cold of Lake Michigan to the sweltering heat of Thailand & lots of travel in between. I've bought these vest before in Large & XL. The XL looked a tad bit loose on me but after utilizing the pockets to their fullest, I realized, I would have more capacity & easier access to them with the XL's (I'm 6', 200 lbs.). Also, the XL seems approx 6 longer. Although I've worn the Large RV's for several years, they are still in decent enough shape to give to my son for camping/hiking! These vest are as good or better than any I've purchased in the past. I purchased 5 (3 black, 2 khaki)with this review & may order a couple olive drab later. Rated 3 out of 5 by Fishing for excuses from Just OK I guess I shouldn't expect much for 25 bucks. The size was correct and the zippers worked, at least. I feel, if you're going to make a garment with a certain amount of cotton, why not make good use of it? The 2 inside pockets are too narrow. I guess they're useful if you have 2 flip phones. The zippered side pockets are too high and hence hard to access in a hurry. The top front pockets are just plain bizarre. You can't make full use of them, as they are sewn together inside with a tiny opening in the center. Drop something small into them and then spend a few minutes trying to fish it back out. Maybe they're for a single pen or lollipop, one for each side. Nice huge pocket on the back. I guess that's for when your girlfriend gets tired of carrying her purse. I'm just trying to put myself into the mindset of the designer of this thing and I'm not having much luck. I give it three stars because it looks OK on me. Rated 5 out of 5 by John Manila from excellent vest I use this vest every time i do photoshoots in my studio but mostly outdoors. Plenty pockets which i use for all my small accessories i use in hand which other wise i was always looking through the mess of a bag. Given the fact i am in southeast asia's warm weather and any additional clother would be a disturbance this vest is a plus. Feels cool wearing it. Rated 5 out of 5 by traveling today from Great pockets I'm planning to wear this vest while birding early morning hours on the shore. I need the pockets for camera equipment and stuff I would normally carry in my purse. On a hot day this would be hot around the neck, but most days I will be very glad to have the hood and the collar to protect my neck from the sun. I like that it's cotton and loose, thus cooler. Rated 4 out of 5 by JBMFT from Great vest for the money! This is a great vest, much better than I expetced for the price. There are tons of pockets for gear and the hood is an excellent touch. The front chest pockets are a bit odd and aren't sewn down but 10 minutes with the sewing machine fixed that. Couldn't be happier with the product. Thanks Humvee and thanks B&H!